If you're someone who loves to go trekking off-the-beaten track, you'll be delighted by the region around Kalap village in Uttarakhand. 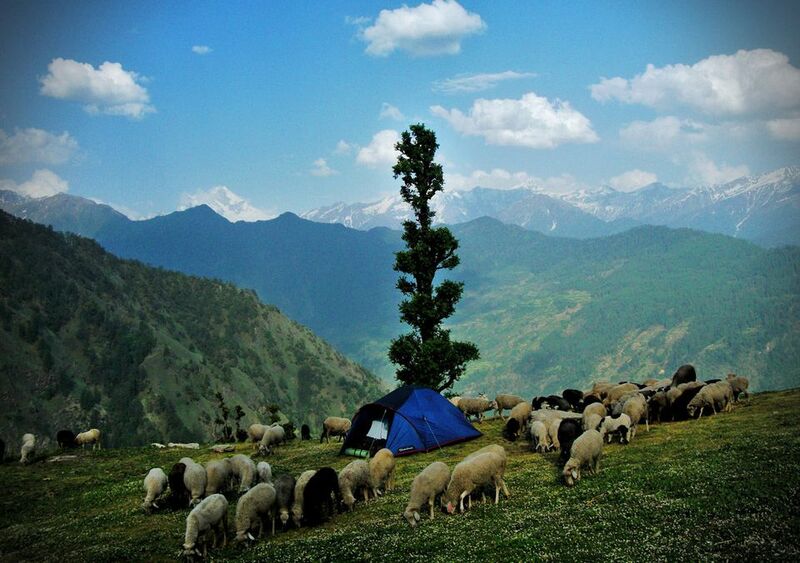 The trek trail follows a path well trodden by seasonal nomadic herders but is unexplored by outsiders. The tiny village of Kalap is located 7,500 feet above sea level, in the remote Tons Valley of Uttarakhand's far northwestern Garhwal region. It's not accessible by road or rail, and has remained completely untouched by mainstream tourism. Agriculture, and the rearing of sheep and goats, are the main sources of income there. Yet, it's not enough, and the village's youth are commonly forced to migrate to the plains in search of work. Uttarakhand, while blessed with spectacular natural beauty, is also extremely ecologically fragile. Its remoteness and challenging terrain has always made it difficult for inhabitants to earn a livelihood. With this issue in mind, Anand Sankar established a responsible tourism project in Kalap in mid 2013. A photojournalist from South India by profession, Anand decided to become a responsible tourism provider after covering development-related issues and interacting with a number of communities across the country. By bringing responsible tourism to Kalap and other villages in the Tons Valley through the Tons Trails social enterprise, Anand hopes to introduce new skill sets that will enable the villagers to sustain themselves without losing their future generations. Anand has also formed the Kalap Trust to provide education and medical assistance to the villagers. (You can read more about his work in this news article). Treks around Kalap offer stunning views, pristine mountain rivers, and jungle alive with scents of pine, deodar and wild lavender. However, even if you're not into trekking, Kalap is a remarkable place to get away from it all and experience the simplicity of village life. Comfortable homestay accommodations, with western style facilities, have been set up for guests in the villagers' traditional wooden houses. They're friendly hill people who warmly welcome guests. Quality camping equipment is also provided. There are three options for visiting Kalap: book a homestay, join a fixed departure trip or plan your own. If you want to go on your own at a time that suits you, there are three trips of varying lengths to choose from depending on your fitness level. Kalap Experience (Five Nights) -- Available all year round, you'll get a taste of village life including local food, folklore interpretation, cultural performances, and day treks in the area. It's family friendly and not very strenuous. The Nomad Trail (Five Nights) -- On Kalap's signature trail, walk and camp with nomadic herders as they take their sheep to feed on the high altitude grasslands of the Himalayas. The trail is active family-friendly and moderately strenuous. It's possible anytime from April to November. The Tons Trail (Four Nights) -- Uncover the folklore of the Upper Tons Valley on this trip. You'll be taken on a drive to meet and interact with the communities that live there. Stay in local homes, eat unique cuisine, and go glamping by the river. No trekking is required and it departs all year round, except from June 15 to Sept 30. Fixed departure trips are ideal for solo travelers and offer special seasonal experiences, such as the annual Kalap Village Festival in January, and Parents & Kids Vacation Retreat in summer. A 10-night High Altitude Nomad Retreat is also offered as a fixed departure trip. However, it's for adventure enthusiasts and experienced trekkers only! This trip follows nomadic herders to some of the highest grasslands in the world. You'll get to visit and explore two high-altitude Ramsar wetlands around two massive glacial lakes -- Barad Sar at 14,512 feet and Kana Sar at 14,650 feet above sea level. If you want to learn about life in the remote inhabited regions of the Himalayas, this trek is a must do. More information is available from the Kalap website.